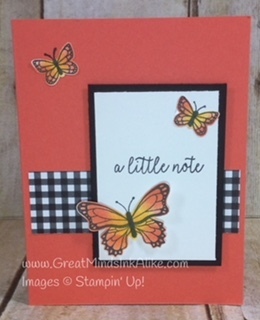 The new Butterfly Gala stamp set has so many fun possibilities when it comes to adding color. 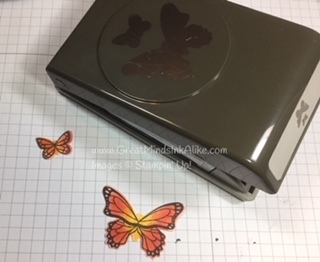 You can use some of the images in the stamp set to add wing color, you can color with Stampin' Blends or markers or the easiest way of all - sponging! Sponge you light color with a sponge dauber. 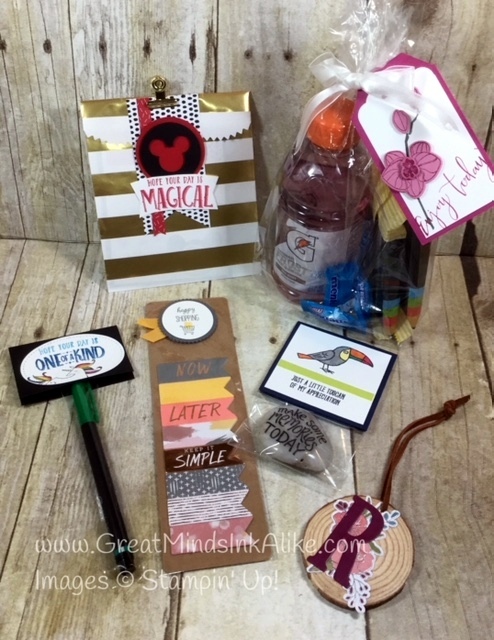 Add an additional color or colors with a new sponge dauber. If you are just making one card, you can sponge from light to dark with just one dauber. I planned to make several so I used a clean dauber for my second color. 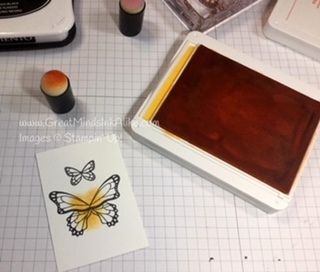 Punch the butterfly out and get rid of the "messiness" of the sponging. 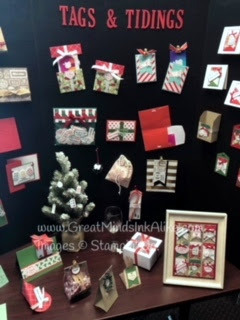 I recently had the pleasure of creating a display with the Tags and Tidings stamp set and coordinating Christmas Tags framelit for a meeting with 100 other demonstrators. As many of you know, I host a tags class each December so I was immediately drawn to this set when glancing through the catalog. The beauty of this stamp is that all 16 tags cut with one crank through the Big Shot. 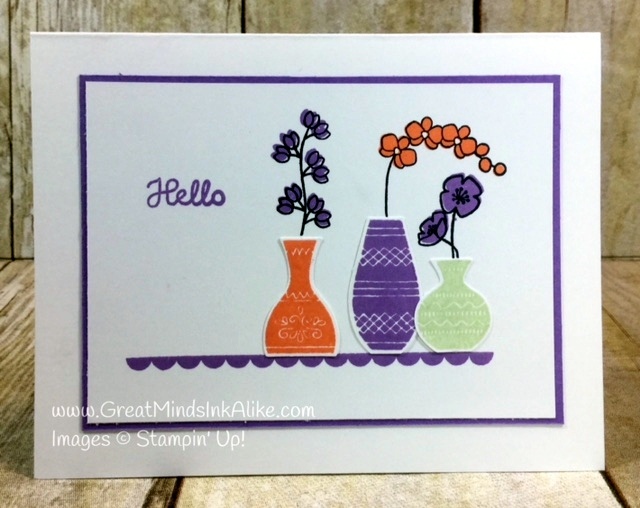 Here's a Stampin' Up! video if you want to see this set in action. But I wanted to think a little more outside the box and create some bigger projects. Stay tuned for some closer images and some hints and tips! I have two classes next week, and I had fun doing a mix of all occasion and Christmas cards. Have you tried the Stamparatus yet? It’s so easy to use — even on a super quick card. After stamping these 3 leaves, I didn’t want to take my chances with a crooked greeting so I pulled out my Stamparatus. 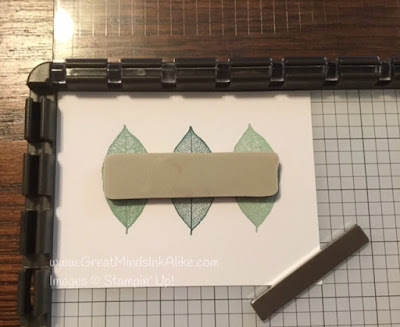 Place the card stock on the Stamparatus and hold it in place with the magnet. 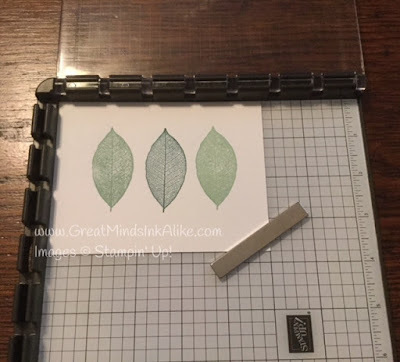 Should you goof when stamping the image, you can just re-ink and re-stamp. Position the uninked stamp on the cardstock. 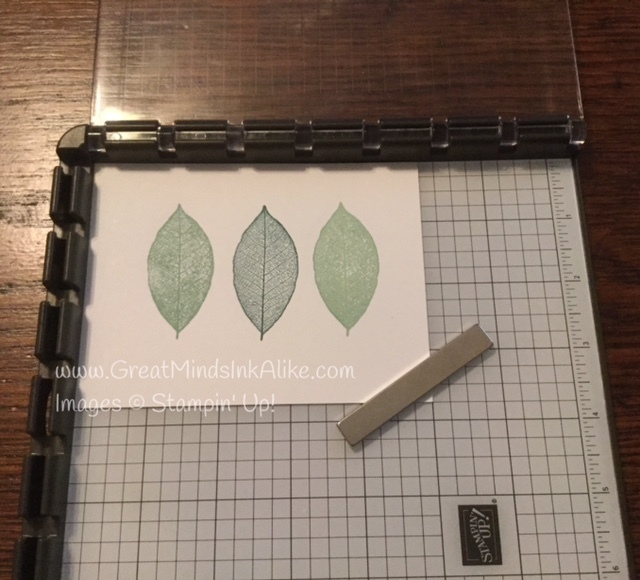 And shut down the flap on top of the stamp. This will pick up the stamp in exactly the right spot. Close the flap, press gently and voilà! 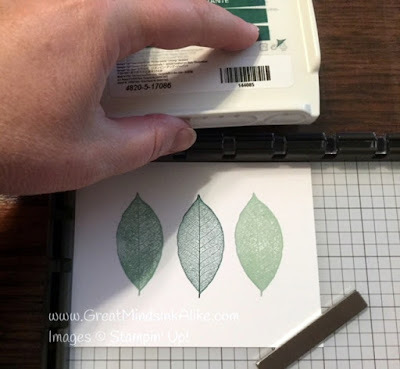 There are so many uses for the Stamparatus and it's so easy to use. I keep mine by my desk and pull it out often! 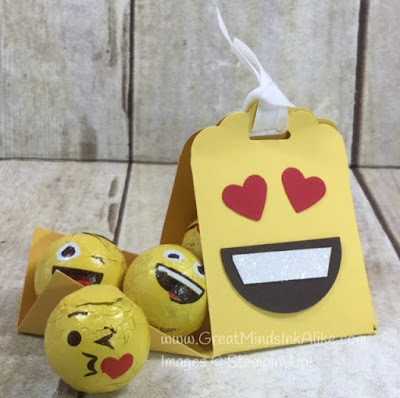 Click here to order your own right now! Whoa! 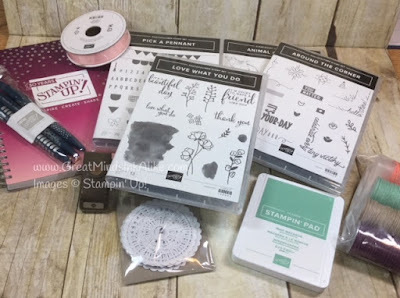 This is a great opportunity for you to sign up and choose your free set of stamp pads! Click here to learn more about how you can choose $125 in product for $99 with free shipping, join an amazing group of stamping friends and get an entire set of stamp pads for free! 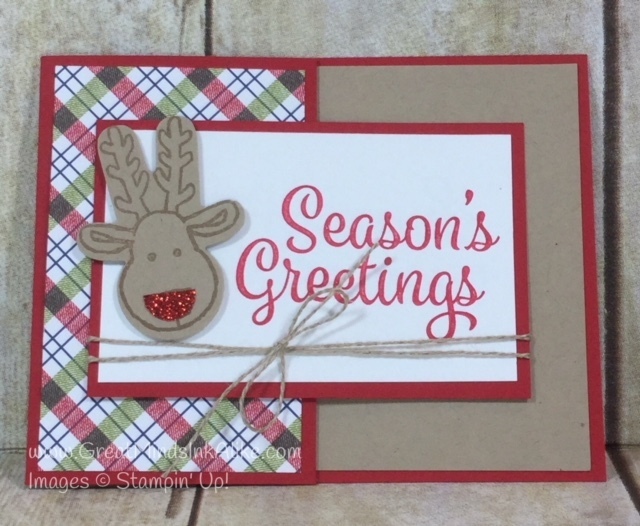 I've always loved plaid so when I flipped through the Under the Mistletoe Designer Series Paper, this piece jumped out at me! And it paired pretty well with a glittery reindeer! I needed a bigger greeting so I pulled this favorite out of the Snowflake Sentiments. If you'd like some new Christmas DSP, check out the August buy 3 Get 1 Free special. 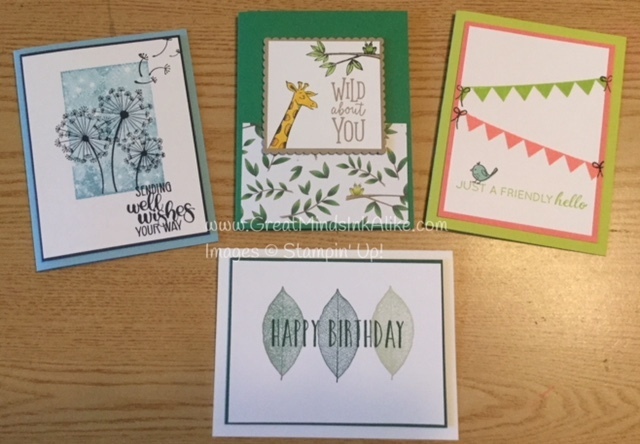 When you order select paper packs, you can get one free! Visit my online store to check out all the papers eligible for this great deal. It is time for my annual Christmas in July Stamp-a-Stack next week. I am holding out and not buying any of the new sets in the annual catalog because I just know the holiday catalog will have some amazing new sets in it! So I pulled out Snowflake Sentiments, but I use the new color Merry Merlot. 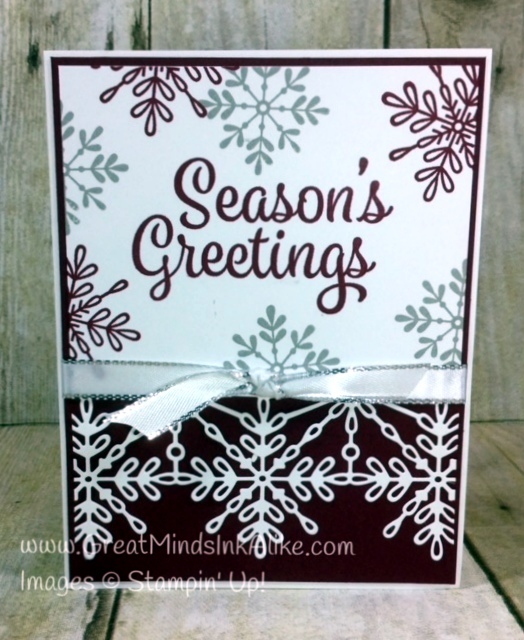 I used Smoky Slate, the Silver Metallic-Edge Ribbon and the Swirly Snowflakes Thinlits to create an elegant Christmas card. I finished school yesterday and today I played with my new stamps and colors. 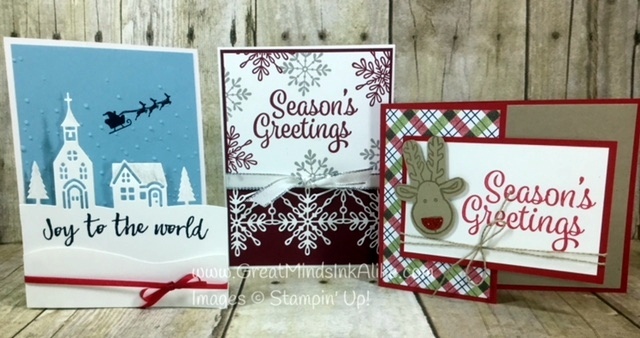 Here are the 3 cards we'll be making at June's Stamp-a-Stack. I knew I would like Varied Vases and coordinating punch when I saw it in the catalog! So when I got a chance to play with my pre-order, this was one of the first sets I pulled out. (Demonstrators can pre-order from a select list of new items a month before the catalog is available -- ask me how). 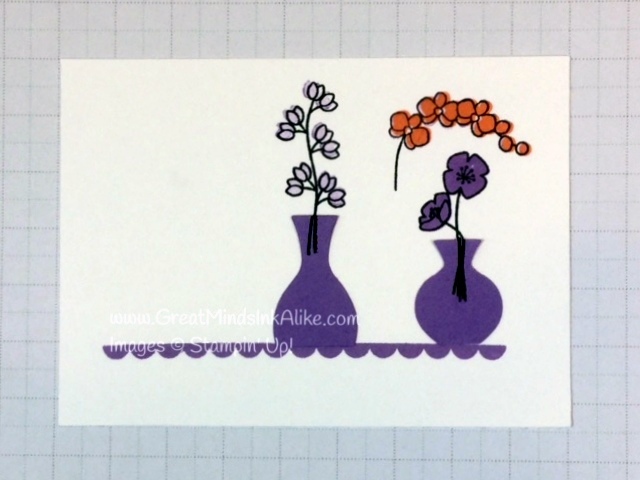 I am planning my monthly Stamp-a-Stack with all new products this Friday, and this will be one of our 3 cards. 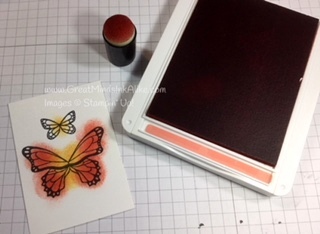 I think my stampers will love the new colors as much as the new stamp set! To help place the flowers exactly where I want them, I punched vases from scraps. I place the scrap vase where I wanted it, and I stamped over the top. I also didn't ink up the entire length of the stem on the shortest vase. (I think this would be a great card to make with the new Stamparatus too)! On Stage 2018 and New Catalog!! 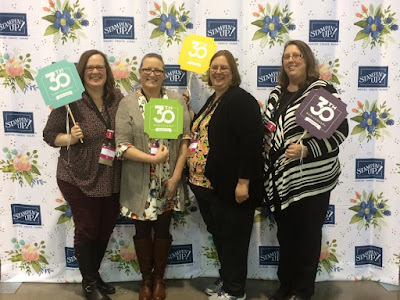 Last weekend 3 of my stamping friends and I made an after work trip to Milwaukee for a Stampin' Up On Stage event. 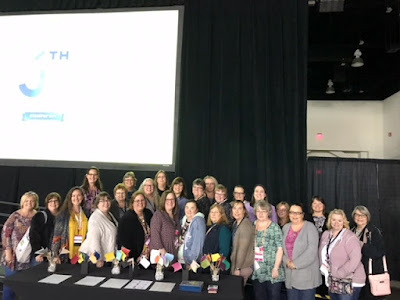 It is always a whirlwind, but it's so much fun that it's totally worth it! We got our hands on a copy of the brand new catalog, and in a week's time, mine has become a little dogeared. It's one of the best yet! We also got to try out some of the new products. 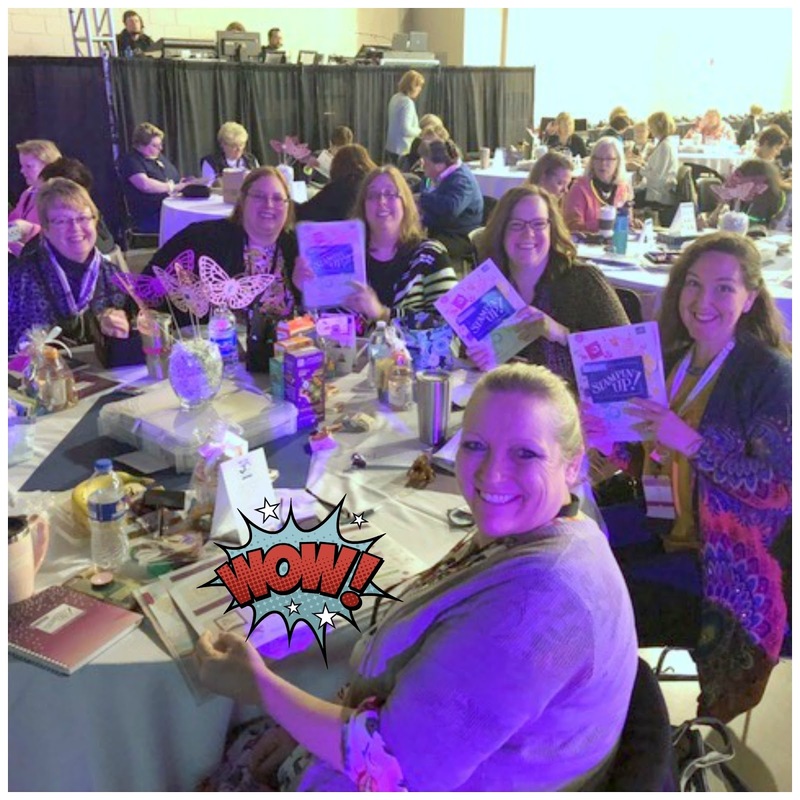 Here are some goodies gifted to me by my fellow demonstrators! I made these cute little boxes for my roommates. And here are the freebies I came home with after OnStage!! One was in our bag when we checked in, 3 of them were different prizes and the rest were the items I got when we divided up the leftover make-n-take supplies! Quite a haul! 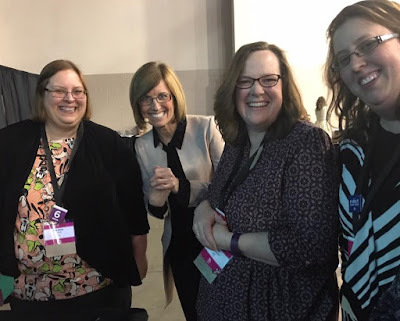 And here are the wonderful people I am lucky enough to know. If you'd like to get in on all of this fun next time, click here to join my team!! 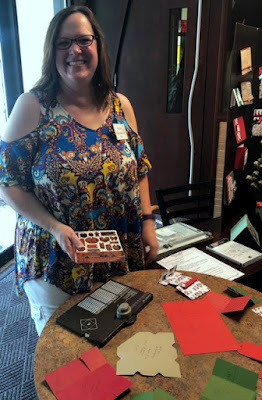 When we finished up our make-n-takes our table went to the front to look over some samples and Shelli, the founder of the company, came up and put her arms around us and asked us what we thought of the new colors!! We had a nice chat until it was time for her to go back up on stage. What a fun bonus! There is so much to look forward to in this catalog. I'm pretty excited about the Color Revamp. 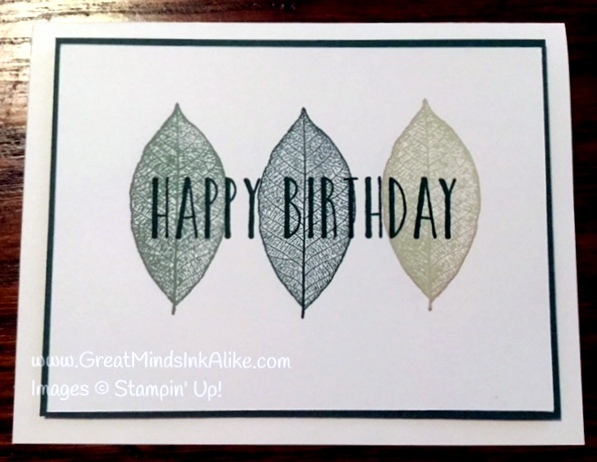 Every 3-5 years Stampin' Up will update the colors with either a refresh or a revamp. So this year, in addition to 5 new InColors, we have a ton of returning colors from past InColors or completely new colors. If you want to see if your go to color is retiring, click here and order right away as they are available while supplies last. Click here for the list of retiring products.